This morning I picked up a package that turned out to be my snack from the reddit snack exchange! Last year when I participated I got an Amazon box full of bags of chocolate chip cookies. 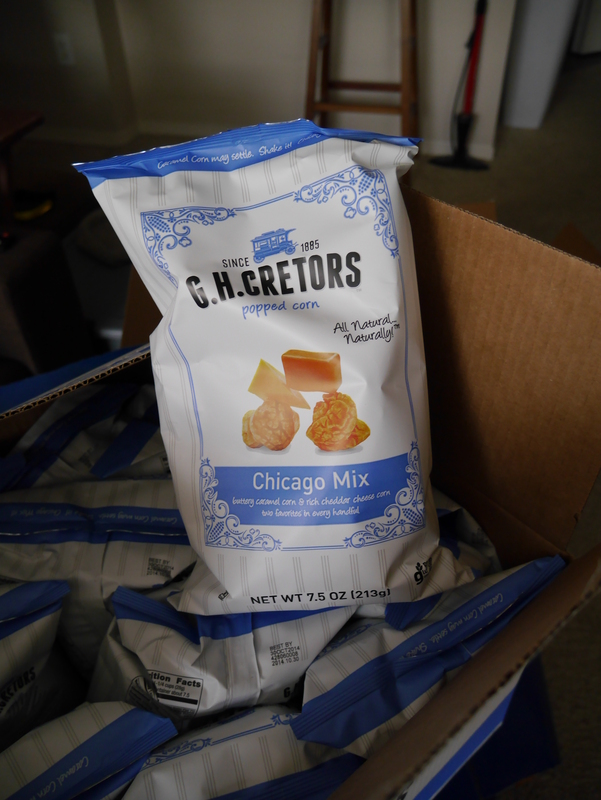 This year I got an Amazon box full of Chicago Mix! I think I’m going to be participating in this snack exchange for years to come. I now have 12 bags of cheddar and caramel popcorn. I’ve never had Chicago Mix before but it’s really tasty. Want to try some? Come on over and I’ll share with you! Thank you to the awesome redditor who bought me these snacks, although you may not ever read this blog post, I am grateful (and will be telling you on reddit as well)! YUM! Bring some to Sunday night dinner so we can all taste test! Good idea! I’ll do that. can you save a bag for me to try? looks right up my street! or can i buy it myself? Sure I can save one! I’ve got plenty, there might be more than one still when you get here!